Several years ago, I used to wait tables at a sushi bar. Working on New Years Eve there was especially fun, because of all of the rituals and special food prep leading up to and on the holiday. The day before, the waitstaff would tell me how to perfectly pronounce akemashite omedetou gozaimasu (Happy New Year) while bowing on the gozaimasu—which I repeated countless times during the evening and still remember how to pronounce. The menu was special and decadent and the restaurant was always packed. Before midnight struck, the cooks would frantically clean the kitchen until it was absolutely spotless, so the new year could literally start with a clean slate. 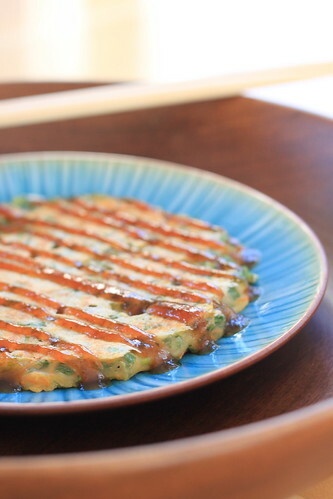 Despite all of the elaborate parts of the evening, what I remember most was a special dinner the chef would make before our shift that night, which included a special okonomiyaki, filled with greens and ginger, and served with a tonkatsu sauce. This weekend, I took a stab at recreating the chef’s okonomiyaki, and taking the first bite of this brought back all of those memories for me. The sauce I made to serve with it was thick and sweet and delicious and complimented the okonomiyaki very well, but you can also buy prepared tonkatsu sauce. Heat the mirin, soy sauce, worcestershire, agave and vinegar in a small saucepan over medium heat until it comes to a small boil. Combine the flour, baking powder and salt in a large bowl. In a smaller separate bowl, whisk together the soymilk, Ener-G and cider vinegar and let it sit for about 5 minutes to slightly thicken. Then slowly add the liquid into the flour mixture and mix gently until combined. Do not overmix. Add in the vegetables and gently combine again with the batter. Set aside. Heat a flat non-stick pan over medium high heat. Once it is preheated, spray it with a bit of cooking spray. I used a flat-bottomed 3/4 measuring cup to scoop out the batter and slowly pour it onto the pan. Then I kind of flattened the pancake out using the bottom of the measuring cup. Cook for about four minutes on each side or until golden brown. Serve immediately with the sauce. This also tastes great with Vegenaise on the side. Hi there! I'm your new biggest fan 🙂 I totally have a meat and potatoes guy and I really struggle trying to cook for us both. Can't wait to try the fish and chips!! What a great recipe. Going to have to try this one. Thanks juanita! I love how food and memories are so closely related. Wow — thanks ashley! Cooking like this is a challenge, but a fun one! What a stunning picture! 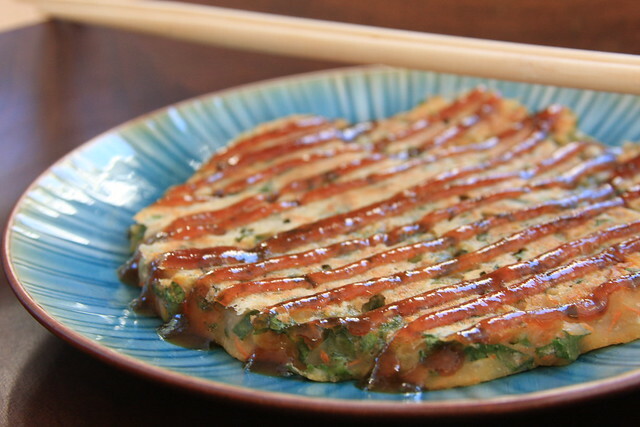 I've never had okonomiyaki, but I'll have to bookmark your recipe. Thanks! It's delicious! I put cabbage, carrot, grated ginger and a grated potato in mine and served just with vegan mayo and soy sauce . Looks delicious, but the shredded cabbage is conspicuously absent. Try adding a cup of finely shredded and diced cabbage to this and omitting the kale. Most okonomiyaki I had in Japan could be described as a cabbage omelet. Thanks for the recipe!